A new Â£1m state-of-the-art dental centre giving patients on-the-spot emergency treatment in Midlothian is to have trained "phobia" dentists. 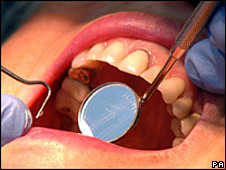 The Bonnyrigg Dental Centre, which has 20 dentists and dental care staff, will aim to help nervous patients. Five new, purpose-built dental surgeries will be situated within the former Bonnyrigg Health Centre. Two of the surgeries will provide emergency and short courses of treatment for unregistered patients. The additional three surgeries will accept patients on referral for special care, frail older people and paediatric services. Health Secretary Nicola Sturgeon will officially open the building on Tuesday. She said: "The new Bonnyrigg Dental Centre offers high quality NHS care and specialist dental services, right in the heart of the community. "Not only do its five dental surgeries offer treatment for those not currently registered with an NHS dentist, but it also offers more training opportunities for the dental professionals who work here." Robert Naysmith, NHS Lothian Community Dental Services clinical director, said: "I am delighted that we are now able to offer a walk-in, easy access, emergency dental service. "Three of the five surgeries at the new Bonnyrigg Dental Centre will offer specialist care services to patients who have been referred by their own dentist. "As well as offering special care frail elderly and paediatric services, it will also offer a service to patients who are anxious about having dental treatment. "This service, which will be undertaken by specially trained dentists, will offer advice and support as well as mild sedation for this type of patient, who have been unable to visit their own dentist." The community mental health team also operates from another wing of the building, providing an out-of-hours service for patients in East Lothian and Midlothian.